April is designated as Child Abuse & Neglect Prevention Month nationally & in Missouri. 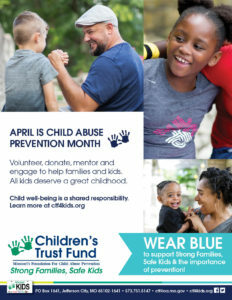 It is a month to highlight & make an extra effort to create awareness about the importance of strengthening families & preventing child abuse & neglect. Please check out the following links & use the CTF related fliers (coming soon) & logos at your convenience to help spread the word in your community about prevention. National Go Blue Day is Friday, April 5, 2019 — But let’s celebrate Go Blue Day every Friday in April! Wear blue on every Friday in April in support of the importance of child abuse & neglect prevention! Go Blue Wellness Walk is on Friday, April 19, 2019 — Please see the related flier on this page. Thank you! Take care of yourself, so that you can take care of others…BETTER! Let’s get outside! Please join us between 11:00a – 1:30p Friday, April 19, 2019 for a 1.3 mile Go Blue Wellness Walk from the Harry S. Truman (HST)Building through downtown Jefferson City. >At noon, please join us for a group photo at the HST 4th Floor entrance. >Don’t forget to wear BLUE in support of Strong Families, Safe Kids! >FREE water, snacks, & give-aways while supplies last! Child Welfare Information Gateway Prevention Resource Guide — Practice prevention throughout the year!